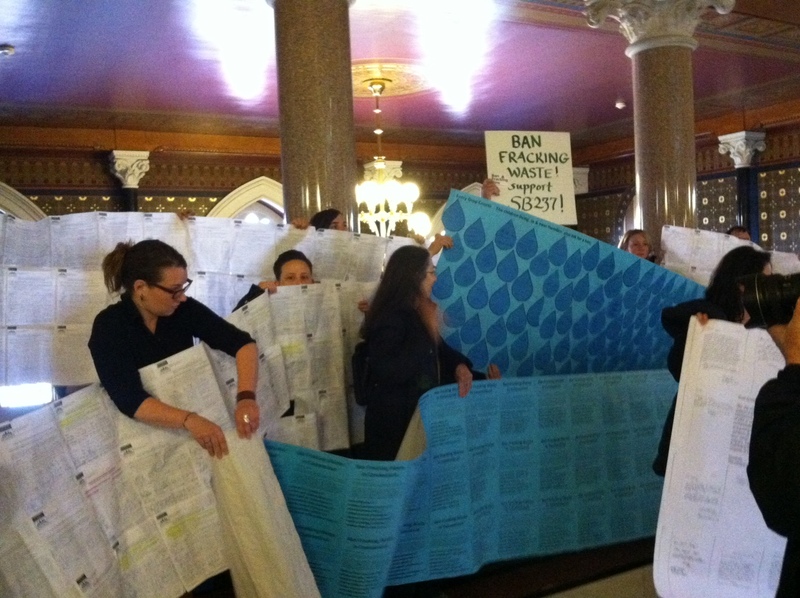 Hartford, CT – Environmental and public health advocates delivered over 5,600 signatures from Connecticut residents to the office of Governor Dannel P. Malloy and members of the House and Senate leadership today calling for legislation (SB 237) to ban fracking waste in Connecticut. Fracking, a highly controversial process of extracting oil and gas taking place in nearby Northeast states, produces hundreds of millions of gallons of highly toxic, potentially radioactive liquid waste , as well as heavily contaminated solid waste by-products. While Connecticut does not have industrial oil and gas development, it remains vulnerable to out-of-state fracking waste being transported or disposed of within the state’s borders. Absent state action, out-of-state fracking waste could be brought to Connecticut and trucked through communities, sent to sewage treatment plants, deposited in municipal landfills, and even spread on roads as a de-icer or dust suppressant. 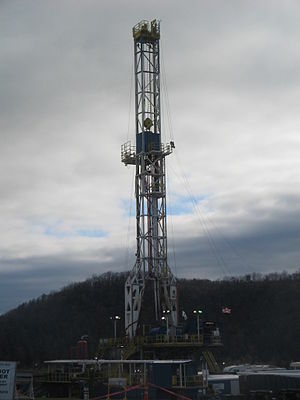 Proposed legislation (SB 237) would protect Connecticut by banning the transport and disposal of fracking waste in Connecticut. “Drilling and fracking a single shale well can produce millions of gallons of toxic wastewater and hundreds of tons of potentially radioactive solid waste. We cannot compromise by simply regulating how much fracking waste can be disposed of — to protect our health we must prohibit the disposal of fracking waste throughout Connecticut.” said Nisha Swinton, New England Director for Food & Water Watch. Exemptions and loopholes for the oil and gas industry at the federal level necessitate that states take action to protect themselves. Oil and gas companies are exempt from disclosing the toxic chemicals used in fracking operations, making the waste created from the fracking process notoriously difficult to treat. The hazardous waste loophole in federal law allows oil and gas companies to transport and dispose of hazardous fracking waste products without categorizing it as hazardous waste and treating it as such. This process leaves communities vulnerable to exposure to a range of toxic substances, as traditional sewage treatment plants and industrial waste treatment facilities are not designed to remove or treat hazardous waste. Municipal landfills are also ill-equipped to handle fracking waste. Call up your State Senator and Representative at the link below and tell them to support S.B. 237! And call Governor Malloy at 866-946-1451 today, and ask him to pass SB 237! Capitalism vs. the Climate is part of a new coalition–the name is still being decided–to stop the expansion of the Algonquin fracked gas pipeline. CvC has filed for “intervenor status” against the proposed expansion, as have Fossil Free Rhode Island, Food & Water Watch, Sierra Club Lower Hudson Group and Better Future Project. Video taken by Stan Heller last weekend in Voluntown, CT at the coalition’s first planning summit. Brooklyn, NY – Food & Water Watch, Sierra Club Lower Hudson Group and Better Future Project joined with community groups across four states, New York, Connecticut, Massachusetts and Rhode Island, to call on the Federal Energy Regulatory Commission (FERC) to deny approvals for Spectra Energy’s Algonquin Incremental Market (AIM) Expansion Project. A meeting was held in the Town of Cortlandt, NY last night and many stakeholders raised significant concerns about the project’s impacts on the environment and the risks to health and safety of residents in the region. The project would cut across environmentally sensitive areas, under the Hudson River, near an active quarry in the West Roxbury section of the City of Boston, and through a number of major watersheds and public lands. The groups are urging FERC to include the environmental impacts resulting from fracking as well as cumulative impacts of the project, as the pipeline will deliver “fracked” gas from Marcellus Shale gas fields. They also call on FERC to look at the potential impacts of exporting gas overseas. The project will expand capacity to a pipeline, which connects to the Maritimes and Northeast pipeline that leads directly to Canadian Liquified Natural Gas (“LNG”) export and proposed LNG export facilities. “It’s simply irresponsible to expand the Algonquin Pipeline when we know that our continued addiction to fossil fuels is exacerbating the climate crisis and putting our safety at risk. What’s worse, we suspect that an out-of-state company is building the pipeline primarily to export gas to other nations. We can export the gas, but the leaks, the explosions, and the destructive climate impacts will be felt right here in Massachusetts,” said Craig Altemose of Better Future Project. Algonquin Gas Transmission LLC, an indirect, wholly-owned subsidiary of Spectra Energy Partners LP, filed its application with FERC at the end of February, and the agency gave the public until April 8, 2014 to submit comments on the Notice of Application and to file for intervenor status. By intervening, individuals and groups can challenge any FERC approval later. The other local groups filing to intervene are Capitalism vs the Climate, Connecticut and Fossil Free Rhode Island. Many other stakeholders filed motions to intervene, including Community Watersheds Clean Water Coalition, Conservation Law Foundation, Riverkeeper, the Village of Ossining and the New York Attorney General. 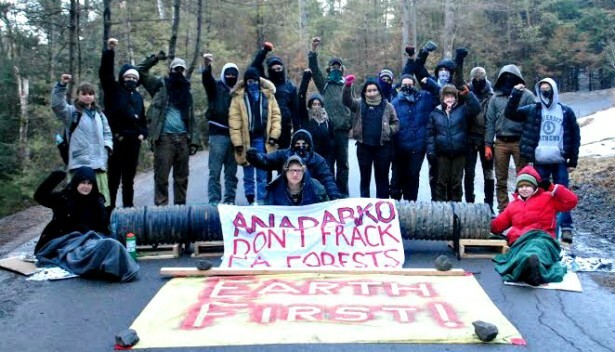 The blockade, which halted Anadarko Petroleum’s fracking operation in central Pennsylvania’s Tiadhagon State Forest for seven hours, occurred alongside the first-ever Shalefield Justice Spring Break. Held in Madisonburg, Pa., last month, the training camp brought together Marcellus Shale residents and over a hundred youth, such as myself, from surrounding states for a week of education and organizing against the extraction process known as fracking, which involves the injection of toxic chemicals underground to break up shale rock containing natural gas. Throughout the week, organizers introduced many young people to community leaders living above the Marcellus Shale rock formation, which stretches from New York to Virginia. Living on the frontline of extraction, shalefield communities experience fracking’s most extreme impacts, including water contamination, air pollution, pipeline explosions and climate-changing methane leaks. On the first night of camp, several Pennsylvanian shalefield residents spoke about how fracking has directly impacted them. Ruth Steck recounted her shock at seeing a helicopter fly over her house one day and drop seismic testing equipment next to her garden. Steck had grown accustomed to quietness, and the loud fracking felt like an invasion. Teacher and business owner Barbara Jarmoska told her story using photos of the stunningly beautiful Loyalsock Forest adjacent to her home and the land that her family has owned since the 1930s. It is where she and her siblings grew up, her son got married, and many young people, including her grandchildren, used to go to hike and ride horses. Today, 40 gas wells sit within five miles of Jarmoska’s home — a health risk that has forced her children and grandchildren to move away. “The noise, the smell, the congestion, the fact that you can’t get in and out of the driveway, all year round — It’s really impossible to describe,” Jarmoska said. Driving around the Tiadaghton State Forest — amidst acres of land that had been clearcut to make way for compressor stations, pipelines, containment ponds, and other fracking infrastructure — a clearer picture of life on the frontline of extraction begins to emerge. For one thing, land that was once public is seemingly no longer. With security guards driving around and police helicopters flying overhead, the fracking industry operates as if it owns the place. In order to build the kind of power that might one day reclaim the land that people like Steck and Jarmoska call home, the organizers of Shalefield Justice Spring Break looked to the decade-long history of Mountain Justice Spring Breaks and Summer Breaks — annual events that have become a powerful recruitment tool for central Appalachia’s movement to end mountaintop removal coal mining. However, one could also trace the concept’s history back to the Student Nonviolent Coordinating Committee’s 1964 Freedom Summer, which brought white college students on their summer break to participate in Mississippi’s civil rights organizing. While there are enormous differences between the campaigns, they share a basic strategy of increasing people’s engagement in an issue, in such a way that it spreads virally from participants to their friends and family back home. This is a large part of how, relationship by relationship, public opinion shifts. 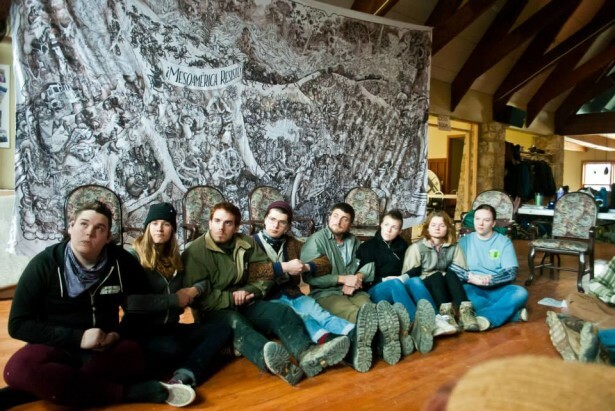 By joining Marcellus Shale Earth First’s blockade and a simultaneous rally outside Anardarko Petroleum’s corporate offices on March 20, attendees of Shalefield Justice Spring Break put into practice the costly direct action skills they had learned all week. Many stepped into unfamiliar action roles, acting as medics, police liaisons, sign painters, media outreach and more. The protesters targeted Anadarko, because the company’s proposed fracking operations in the Loyalsock State Forest have been the focal point of the campaign against fracking in Pennsylvania’s remaining wild places. Groups have held rallies, packed public hearings, and even conducted a 30-day tree-sit to protect the Loyalsock. The most recent blockade and rally sent a strong message to Anadarko and the rest of the gas industry: pull out of Pennsylvania’s state forests or face more resistance than ever before. Between the tree climbing, capture-the-flag, talent shows and bonfires, people somehow found time to discuss organizing plans for the future. Maryland residents discussed how to advance the campaign against Cove Point, a liquified gas export terminal proposed just south of Baltimore. Several sit-ins and a rally of over 700 people have recently turned the terminal into a flashpoint for the nation’s climate justice struggle. Meanwhile, Northeasterners planned to join together against the proposed Algonquin pipeline expansion. Pennsylvania residents talked about building permanent spaces for activists to live collectively and organize in defense of the Loyalsock. In other words, people from Baltimore to Boston and beyond coordinated to challenge the fracking lifecycle on many fronts. With establishment environmentalists’ support, the Northeast and Mid-Atlantic states wish to update and expand the region’s electricity sector cap-and-trade program known as the Regional Greenhouse Gas Initiative or RGGI. 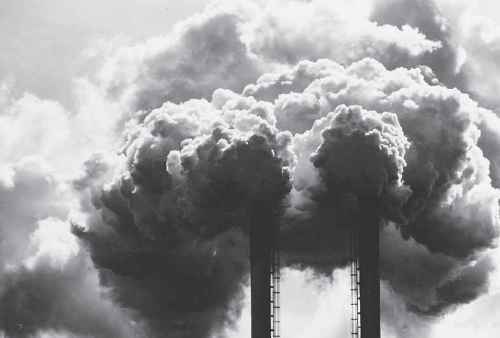 At quarterly auctions, RGGI sells permits for pollution to electricity companies, banks and other bidders, before letting these parties trade with each other on a pollution market. An update currently being implemented to RGGI’s Model Rule would lower the number of pollution rights sold at these auctions, theoretically reducing the region’s pollution over time. A number of factors, however, make RGGI unlikely to fairly or effectively reduce emissions.RGGI’s update could bring to the region new pollution hotspots in poor and minority communities, increased use of carbon offsets, and a greater reliance on dirty, greenhouse gas-emitting energy sources like biomass and natural gas. On Wednesday the CT Roundtable on Climate and Jobs held their forum on natural gas. Dan Fischer was asked to speak for 3 minutes in between two speakers who were in favor of natural gas. His comment is below. The bottom line is that we can create jobs and energy without poisoning workers with silica dust, risking their lives to an explosion, and sacrificing the Marcellus Shale and Bridgeport. Deb Eck was working 96 hours a week to support her 10 and-a-half year-old twins last spring when she received a notice. She was being evicted along with 32 families of Lycoming County, Pennsylvania’s Riverdale Mobile Home Park, so that Aqua America could construct a pump station needed for fracking natural gas. Several of her neighbors were forced to spend their retirement money to move their trailers and sheds. When tonight’s crowd of labor and environmental advocates bands together, we are undefeatable. The fossil fuel bosses knows this, and they’d like nothing more than to divide us, to disperse us just as quickly as they dispersed the Riverdale Mobile Home Park. We can’t let that happen. While all the signs of climate change are assaulting our state with a ferocity never seen before, it seems the current administration is content to ignore them and dismantle any environmental progress that Connecticut has made with backdoor deals, late night bargains and an energy strategy which puts more emphasis on supporting polluting industry interests than serving the state and it’s citizens. With the memory of Superstorm Sandy barely faded from the headlines and the recovery efforts still underway Gov. 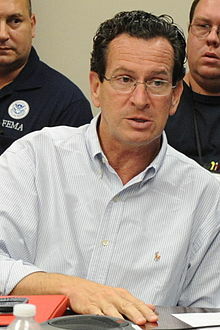 Dannel P. Malloy and DEEP Commissioner Dan Esty suggest that the best way to update the energy grid that contributed to the power to that storm is to subsidize and evangelize for the natural gas industry whose extraction emissions could increase the probability of more storms in the future. The climate science is clear and it demands an immediate transition to clean, renewable energy and in the final days of this legislative session it is clear that these demands are being ignored in favor of propping up the status quo.